The food trade knows no boundaries. It is becoming more complex for manufacturers to control food safety and quality, while at the same time risks arise faster and stronger. Social developments, scandales and increasing legislation put enourmous pressure on the industry and its reputation. A food safety issue harms trust. Resulting in social unrest and political authorities taking measures in the form of more and more (inter)national regulations. Large companies develop their own standards and practices to manage risks and to protect their brand and reputation. They go a lot further than legislation and standards require. Also the demands imposed on packaging and storage of food are increasing. Fawic develops and manufactures durable boxes that meet the high demands of the food industry. A well-established Swiss food manufacturer decided on the Fawic FB20 box as outer packaging for incoming goods and raw materials. The company was looking for a durable and lightweight box that could be delivered in three different sizes. The customized Fawic pallet boxes have the dimensions of 1400x1200x1600 mm, 1300x1000x1600 mm and 1300x1300x2000 mm. 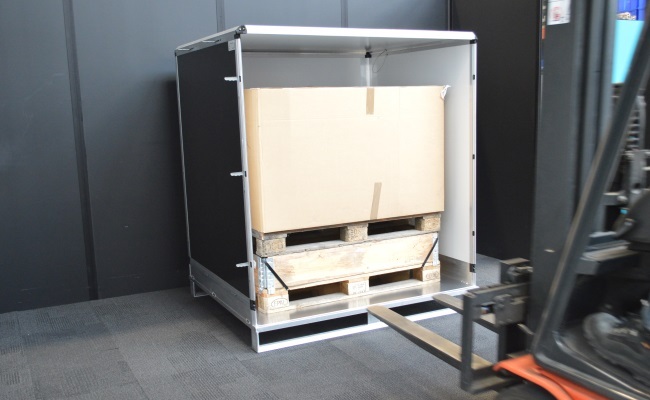 Each box is built on an aluminium pallet so that the box can easily be moved and lifted. The box is provided with a removable front wall and a hinged lid. The box is made of two-color (black and white) impact- resistant and ultra light panels, which weigh only 2,65 kg per square meter. For fear of bacteria and viruses the goods are transported “in quarantine” on the factory premises to the location where they can be opened safely.